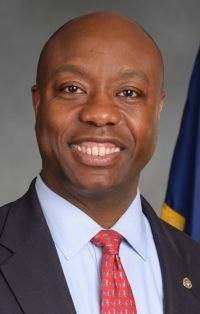 WASHINGTON (CNS) — Republican Sen. Tim Scott of South Carolina shared some anecdotes about his school days during a Jan. 27 event in Washington where he announced that a top goal for him in the new Congress is school choice and expanding access to quality education. At an event sponsored by the American Enterprise Institute, he announced his new legislative “Opportunity Agenda,” which includes a bill in favor of school choice initiatives, which was introduced in the Senate later that day. The CHOICE Act focuses on expanding school choice options for children with special needs, creating a school choice test program for U.S. military bases, and expanding the D.C .Opportunity Scholarship Program, which provides federally funded scholarships to youth from low-income families in grades K-12 to attend participating private schools in the District of Columbia. Scott, an evangelical Christian, made history last November as the first African-American from the South to be elected to the U.S. Senate since Reconstruction. He’s also the first African-American to be elected to both the House and the Senate. He was a House member when Gov. Nikki Haley appointed to the office after former Sen. Jim DeMint resigned in November 2012. Scott had to run for election in 2014 to fill the last two years of DeMint’s term. Currently, 13 states and the District of Columbia have some form of a school voucher program and just as many have instituted some form of educational tax credits supporting the creation of scholarships for K-12 students. In New York, Gov. Andrew Cuomo has included in his budget the Education Tax Credit, passed by the state Senate. The tax credit is critical for “the future countless children across this state,” because “expanding educational opportunities is a clear matter of social justice,” said the cardinal, who also is president of the New York State Catholic Conference, the public policy arm of the state’s bishops. John Schoenig, of the University of Notre Dame’s Program for Educational Access, told CNS in a May 2013 interview that as more states use vouchers or tax credits, it improves the likelihood of other states adopting them. The Notre Dame program was formed in 2010 to conduct research, training and outreach efforts to help low-income families obtain financial access to a faith-based education.